According to a new market report published by Transparency Market Research titled ‘Household Vacuum Cleaners Market – Global Industry Analysis, Size, Share, Growth, Trends, and Forecast, 2018 – 2026, the global household vacuum cleaners market is expected to reach a value of US$ 18,936.9 Mn by 2026. The market is estimated to expand at a CAGR of 4.7% during the forecast period from 2018 to 2026. 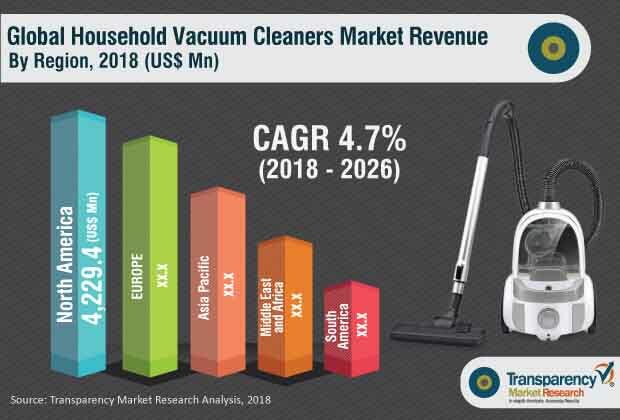 In terms of volume, the market is expected to reach over 79.1 million units at a CAGR of approximately 4.5% by 2026.The household vacuum cleaners market in Asia Pacific is projected to expand at a rapid pace during the forecast period. According to the report, the global household vacuum cleaners market is experiencing high-paced expansion in its size and valuation due to increase in the number of women in the workforce, change in consumer lifestyles, and increasing awareness about indoor health and hygiene. Despite the fact that the number of working women has increased since the past decade, women still do majority of household chores, which has led to the demand for convenient and efficient household cleaning tools. The household vacuum cleaners market has been segmented based on product type, distribution channel, and region. Based on product type, the market is categorized into upright vacuum cleaners, canister vacuum cleaners, central vacuum cleaners, robotic vacuum cleaners, drum vacuum cleaners, wet/ dry vacuum cleaners, and others (handheld, stick, etc.). The canister vacuum cleaners segment accounted for a prominent market share in 2017, as these pumps are capable of cleaning tiny dust particles and even pet hair. In addition, the presence of HEPA filtration technology in vacuum cleaners is gaining traction among consumers. The use of advanced cleaning products helps in better cleaning of dirt, and consequently prevents respiratory allergies. Moreover, robotic vacuum cleaners are anticipated to expand at a fast pace as manufacturers are initiating innovations to increase the reliability, productivity, and performance of the product, which are capable of cleaning floors, wall corners, and can also mop the floor. In terms of distribution channel, the offline stores segment is expected to expand at a CAGR of 4.5% to reach over US$ 10,000 Mn in the near future. The segment is followed by the online stores segment, which is anticipated to grow at a fast pace. Manufacturers are focusing on e-commerce/ online channels and internet retailing as it helps to lower the cost of the product by reducing the rental cost of physical stores and the cost of staff that physical stores require. Chinese internet retailers such as Alibaba are taking up this opportunity to sell more products online with great offers, product discounts and promotions, and targeting small household consumers who look forward to buy these appliances. In terms of geography, North America dominated the global household vacuum cleaners market in 2017 with more than 32% share and is expected to maintain its leading position during the forecast period, followed by Europe. In Asia Pacific, China and Japan are dominating the household vacuum cleaners market, followed by India. The market in Asia Pacific is projected to expand at a fast pace due to the swift pace of urbanization in various economies of the region, which is fueling the substantial uptake of household vacuum cleaners. The rising disposable income of consumers, especially in China and India, is leading to a surging demand for modern home appliances including vacuum cleaners. In addition, supported by a rapidly expanding middle class in China and India, Asia Pacific is expected to remain the fastest growing region for household appliances. Some of the leading players of the household vacuum cleaners market are Bissell Inc., Dyson Ltd., Electrolux AB, Eureka Forbes, Haier Group Corporation, HausVac Inc., iRobot Corporation, Koninklijke Philips N.V., LG Electronics Inc., Miele &Cie KG, Panasonic Corporation, Robert Bosch GmbH, Samsung Electronics Co., Ltd., Oreck Corporation, BLACK+DECKER Inc., and Techtronic Industries Co. Ltd. The companies involved in this market are focusing on R&D activities along with technological product innovation to strengthen theirposition in the industry. Moreover, geographical expansion and strategic partnerships & agreements with other companies are key business strategies adopted by household vacuum cleaner companies across different regions. In August 2018, Electrolux AB launched a cordless vacuum cleaner. The product Electrolux Pure F9, uses powerful battery technology and innovative design solutions to provide consumers with a product that combines the performance of a traditional vacuum cleaner with the freedom of a stick vacuum.